Charolais met a dynamic trade in Stirling on Tuesday 22 February at the breed society’s official spring sale where bidding peaked at 45,000gns to achieve a new centre all breeds record; 16 lots sold for five figure sums and 166 lots traded for £5,888, a figure representing 80% clearance leaving Charolais to once again take the lead at the spring multi-beef breed sales. Sale leader at 45,000gns was Maerdy Express, a 15 month old within the breed’s top 1% with a TI +46 and SRI +54. Sired by Maerdy USA, he was the first calf out of Maerdy Puff whose sire, Maerdy Sinndar goes back to the renowned Major, and her dam to the celebrated show champion, Maerdy Empress. Bred and exhibited by Flintshire vet, Esmor Evans, Mold she was knocked down sold to Charlie Boden, of the Boden and Davies partnership, Mellor, Stockport who was making his second significant investment in Charolais within five years having secured the Perth supremo, Thrunton Voldemort in a two way split with Esmor Evans for 55,000gns. “Express will be extremely complementary to our Voldemort daughters, he’ll add a bit of finesse on to their calves,” he said. Next at 13,000gns from the same herd was Maerdy Emir TI +29, SRI +43, an 18 month old by Blackout and the first calf out of Maerdy Cleopatra, a Burradon Talisman daughter and the pick of the year’s heifers from the 180 cow herd. Emir, who stood in reserve place for the junior championship line up was knocked down sold to D Munro, Kingussie, Inverness. Father and son team, John and Raymond Irvine, Tomintoul, Ballindalloch secured the next one, Maerdy Eryr TI +40, SRI +47 for 12,000gns. This 15 month old first prize winner was by Voldemort and out of a homebred dam by Kilboy Liseron. Maerdy Egret TI +35, SRI +42, a 15 month old this time by Populair and out of a dam by Maerdy Grimaldi made 9,500gns to Bill Bruce, Balmyle, Meigle, Perthshire who is staging a major production sale in Stirling in September. Two more Voldemort sons came under the hammer sold; the 19 month old Maerdy Elfyn TI +23, SRI +28 went for 8,500gns to CA Smith, Durris, Banchory, while the senior champion, Maerdy Ellis TI +28, SRI +35 made 5,200gns to Grove Farms, Irongray, Dumfries. Next at 11,500gns for Colin Wight was Carwood Elgin TI +26, SRI +29, another Trident son, this time a 17 month old out of a Simpsons Gregg sired homebred cow to Monzie Farms, Gilmerton, Crieff. Another Welsh consignor enjoying success was Alwyn Rees with his sole entry, Pennal Extreme TI +43, SRI +50, an 18 month old by Dingle Hofmeister, and out of the Killadeas Jack sired homebred Pennal Violet, a member of his 15 cow herd based at Pennal, Machynlleth. Extreme who was full brother to the 12,000gns Pennal Dazzler, sold for 14,000gns to commercial producers, WJ Fraser and Sons, Glenlivet, Ballindalloch. The Campbell’s next best at 12,000gns was Thrunton Everready TI +25, SRI +37, a 19 month old by the 15,000gns Burradon Talisman and out of a homebred cow by the 20,000gns Moncur General from their 130 cow herd. He sold to commercial producer, JW Hogg, Gifford, East Lothian. Another Talisman son in the money was the 18 month old Thrunton Element TI +21, SRI +33. He was out of an Orlando daughter, and made 8,000gns to James Thomson, Kelty, Fife. Thrunton offered two more lots at 8,000gns and both were by Bigal. Cumbrian breeders, David and Marjory Stobart, Cracrop, Brampton who are dispersing their herd in August, secured the 21 month old Thrunton Envoy TI +35, SRI +32 whose dam was sired by the 20,000gns Maerdy Location. The second 8,000gns price was paid by I and D Macrae, Tighnabruaich, Argyll, for the first class winner, Thrunton Empire, TI +31, SRI +32, whose homebred dam was by Talisman. The day’s second 14,000gns call was made for the first class prize winner, Goldies Estate TI +31, SRI +40, a 17 month old by the 25,000gns Thrunton Camelot and out of a Blelack Montgomery sired homebred dam from Hamish Goldie’s 90 cow herd based at Ruthwell, Dumfries. Estate was knocked down sold in a two way split to father and son team, Drew and Bob Adam, Glamis, Forfar and Neil and Stuart Barclay, Crathes, Banchory. Hamish Goldie went on to offer Goldies Equity TI +40, SRI +46 for 10,5000gns to MA Evans, Llanrhaeadr, Denbigh. This 16 month old class winner was by Goldies Ambassador who sired the 13,000gns Stirling leader four months ago, while he was the first calf out of a homebred dam by Killadeas Original. Meanwhile Hamish Goldie invested 12,000gns of his day’s takings in the reserve intermediate champion, Blelack Edition TI +33, SRI +35, an 18 month old bred by father and son team, Neil and Graeme Massie, Dinnet, Aboyne. Sired by the 12,000gns Coolnaslee Adversary, he was out of a dam by Bassingbourn Ralph. The Massies next best at 8,000gns was the 16 month old Blelack Emperor TI +44, SRI +49 to WD Adams and Son, Wigtown, Newton Stewart. A son of the 25,000gns Perth supremo, Thrunton Socrates, he was out of another Ralph daughter. Balthayock Eagle who headed the catalogue’s performance recorded indices, with a TI +54 and SRI +62 was secured for 13,000gns in a joint split between Fifeshire producers, Stevenson Livestock, Anstruther, and Balbirnie Home Farms, Freuchie. 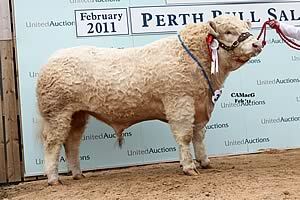 Later Eagle’s breeder, David Walter and his son, Nick, Balthayock, Perth bought back a 25% share of the bull. “I simply didn’t want to lose him,” said Major Walter. “He has terrific stretch and strength, good strong legs and he’s beautifully proportioned.” Sired by the 11,000gns Balthayock Adonis, he was out of a homebred dam by Penfold Seaanchor. A second 13,000gns call followed shortly afterwards for the much admired 19 month old, Newhouse Emperor TI +47, SRI +58 from Drew and Bob Adam. Sired by the 32,000gns Perth champion Solitude Attaboy, he was out of Newhouse Vicky, dam of the 22,000gns Stirling supremo Newhouse Dingdong in February 2010. Twelve months on, Emperor followed in his maternal brother’s exact same footsteps by securing the intermediate and overall supreme championships, a first time achievement for the Charolais breed at Stirling and Perth. “This bull stood out in his class and went all the way through,” said judge, John Christie, “He is very well balanced with a good top line, he is clean, he has well rounded thighs and has all the Charolais characteristics of being a growthy bull and mature for his age.” Emperor went to join Jan Boomaars 125 cow pedigree herd based at Woldingham, Surrey. “He is very correct with good all round accompanying Breedplan figures,” he said. 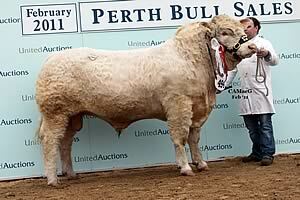 Inverlochy Edit TI +29, SRI +44 attracted an 11,000gns bid for father and son team, John and Raymond Irvine, Tomintoul. Sired by the 30,000gns Balmyle Bollinger, this 19 month old was out of a homebred cow by their Inverlochy Resolve. The buyer was J Mackenzie, Westercraiglands, Fortrose. The Irvines were again in the money later in the day when they sold Inverlochy Express TI +34, SRI +41 for 10,000gns to E Innes and Sons, Glenlivet. An 18 month Lochened Apache son, he was out of a homebred cow going back to Resolve. At 11,000gns, the 18 month old Woodpark Elgin TI +25, SRI +33 was knocked down sold in a joint bid to Archie MacGregor, Allanfauld, Kilsyth and Wallace Brown, Newton Mearns, Glasgow. Bred by Will Short, Beragh, Omagh, he was by the 19,000gns Corrie Alan, and the first bull calf out of a Doonally Olmeto sired homebred dam from his 35 cow herd. Charlie McLean made a successful return trip for Mortimers Farms, Fair Oak, Eastleigh, Hampshire with his sole entry, Mortimers Echo TI +42, SRI +49 commanding 10,000gns in a joint split to the judge, John Christie and Iain Millar, Port of Menteith, Stirling. The 17 month old Echo was by the homebred Mortimers Vanquish a Balthayock Nougat son and out of a homebred dam with a wealth of noted lines including Balthayock and out of the Royal champion, Mortimers Urovision. Next at 8,800gns was Airdlin Everest TI +18, SRI +19, an 19 month old by the 30,000gns Maerdy Andes and out of a homebred dam. He was secured by David Blair and Son, Wormit, Fife. A further three entries shared an 8,500gns price tag. First was Elrick Eubank TI +38, SRI +45, a 21 month by Blelack Nextnews and out of a Pedr Tennessee sired cow. Bred and exhibited by Michael Massie, Mains of Elrick, Ellon, he travelled to Wales with John and Peter Howells, Llanwenog, Llanybydder. Burradon Extraspecial TI +25, SRI +34, a 17 month old from Messrs Curry, Thropton, Morpeth made 8,500gns to RH Gladstone, Thornhill, Dumfries. A son of the 12,000gns Gwenog Banjo, he was out of a homebred dam going back to Blelack Prince. The final 8,500gns call was made by Frank Walton, Thropton, Morpeth for first class prize winner, Edenhurst Extrovert TI +24, SRI +27 bred and exhibited by Peter Vasey, Wetheral, Carlisle. A 16 month old, he was by the homebred Edenhurst Titus who goes back to Knockane Pilot, and out of a homebred dam by Genus Houblon. Earlier in the day, the same breeder offered Edenhurst Excelsior TI +20, SRI +29 for 7,500gns to B Grant, Inverness. A Burradon Talisman son, this rising two year old class winner was out of a homebred dam by Fleets Vibrant. A call of 7500gns secured Balmyle Esmor TI +45, SRI +52 for Bill Bruce, Meigle, Perthshire. This 20 month old was by Maerdy Barbican and out of a homebred cow by the 28,000gns Perth champion Brampton Nacodar and sold to Elsick Estate, Newtonhill, Stonehaven. Females sold to a top of 3,000gns for a cow and calf pair from the Campbell family. Thrunton Campion TI +32, SRI +37, a Blelack Jaguar daughter and out of a dam by Burradon Talisman was sold with her first calf, a seven month old heifer by Newhouse Bigal. Campion was scanned in calf to the 16,000gns Maerdy Cecil. The buyer was W Patterson and Son, Aultmore, Keith. Averages: 166 bulls £5,888; 15 females £1575; one cow and calf £3,150.